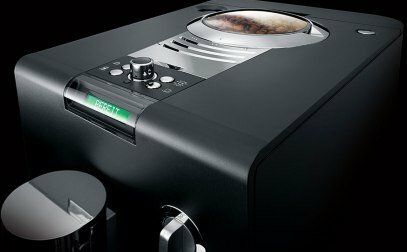 One of the first things you notice about super-automatic espresso brewing systems is the size of most models. Jura has solved this dilemma with their compact brewing system, the Jura ENA 9. Many super automatics come with double brewing systems, large capacity water reservoirs and coffee bean hoppers that are industrial sized. While these features have their place, that place is not in a small kitchen or office environment! Jura ENA 9 One Touch is a fraction of the size of larger models, but still provides all in one brewing. Furthermore, the super-automatic offers a wide range of customizable brewing options. This means that you get all the benefits of a larger model, but without the size and cost. This is the perfect super automatic espresso machine for anyone who wants simplicity without sacrificing quality. The Jura ENA 9 Super Automatic provides a surprisingly wide range of customizable brewing options for such a small machine. You can control virtually every aspect of your coffee beverage. Start by choosing one of the five grind settings on the built-in conical burr grinder. These settings ensure that you get the perfect consistency in your coffee grounds for any beverage you desire. Next, adjust the temperature of the water to suit your tastes by selecting one of two temperature options. Once you have decided on the temperature, program the volume of water to be used. This allows you to make beverages of different sizes with the ease of one touch controls. Now you can program the strength of your coffee, selecting to use either 6 or 10 grams of ground coffee. This complete range of customizable options is guaranteed to provide the perfect beverage every time! Despite its compact design, the Jura ENA 9 Super Automatic is an all in one coffee brewing system. With every component built in, this machine performs every element needed for creating the perfect coffee beverage. A built in conical burr grinder ensures the advantage of fresh ground beans in every shot. The fully customizable brew system guarantees that the fresh coffee grounds provide optimum flavor and aroma. Finally, a fully automatic milk frother provides perfect foam for lattes or cappuccinos each and every time. This all in one design makes espresso beverages as convenient as they are delicious! 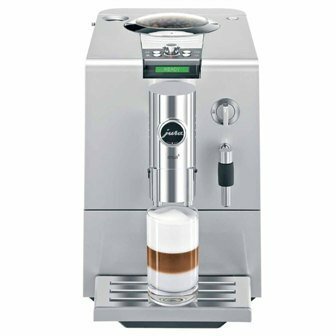 The compact design of the Jura ENA 9 Super Automatic makes it a perfect space saver coffee machine. Whether you have a small kitchen or a tiny office space, this model will be a perfect fit for you. There is more smaller version called ENA Micro 9 with almost same functions. The ENA 9 has a durable plastic construction. This makes it both light weight as well as easy to clean. Any spills or splashes can be removed with a quick wipe from a damp cloth. A bypass doser enables you to use pre ground coffee as well as whole beans. This is convenient if you want to avoid the noise of the built in conical burr grinder. Jura’s patented Intelligent Pre Brew Aroma System uses pre-infusion to get the best flavor from your grounds. This ensures that every espresso beverage has that rich coffee shop taste! Automated cleaning and descaling cycles help to keep the Jura ENA 9 in perfect condition during its lifetime. A height adjustable brew spout allows you to brew espresso straight into different size cups. Lower the spout to 3 inches for demitasse brewing, or raise it to 5 inches for larger cappuccinos or lattes. Energy efficient settings allow you to get the most from your machine without wasting electricity. The Jura ENA 9 Super Automatic comes with an auto shut off feature. This ensures that you never have to worry about leaving the coffee maker on ever again! Thermoblock heating technology means that the boiler will heat quickly and evenly. This cuts down on wait time before beverages, as well as guarantees quality shots every time. Cleaning the Jura ENA 9 Super Automatic is relatively simple and care free. First and foremost, the automated cleaning cycles take care of keeping the machine in peak condition. These cycles do everything from rinsing away residue to descaling the system. The descaling program is particularly helpful for anyone who lives in a hard water region. Overall, the vast majority of cleaning is completely automated and hassle-free. The brew system comes apart for a quick rinse or a more thorough cleaning. Fortunately, the parts are numbered, ensuring easy reassembly. An easy to remove drip tray makes quick rinsing simple and convenient. An automated alert will inform you when to remove the drip tray, as this will enable you to empty used coffee grounds as well. The component that requires the most cleaning is the milk wand. This is because you need to ensure all milk residue is removed after each use. The heat of the wand will cause milk residue to cook onto the wand, affecting the flavor of future beverages. Additionally, you will want to blow out some steam from the wand after each use. This will prevent milk from remaining in the wand where it can sour and ruin the flavor of future drinks. Super automatic brewing systems are a bit of a double edge sword. On the one hand, they provide all of the convenience of an all in one brewing system. This means that a single press of a button can take you from beans to beverage in a matter of moments. Needless to say, most people are very happy with any machine that can perform this coffee brewing miracle. However, there is a downside. As the grinder is built in there is no way of accessing it. This results in the burrs not being able to be properly cleaned every so often. Subsequently, beans that are very oily can contribute to oil residue that will eventually reduce the performance of the burrs. Thus, it is advised that you avoid darker roast beans, as these are notoriously oil heavy. Lighter and medium roasts are recommended, as these are dryer in their consistency. This way oil residue will be kept to a minimum, allowing the burrs to perform to the highest standards. When you first look at the Jura ENA 9 you might think it capable of delivering only moderate quality beverages. Nothing can be further from the truth. To start with, the built in grinder ensures freshly ground coffee for every beverage made. This is critical for anyone who knows just how important fresh grounds are to a coffee’s flavor profile. The pre infusing system brings out the full body of the freshly ground coffee, ensuring maximum flavor. Customizable brewing options further guarantee that you get the perfect beverage every time. Choose the temperature, volume and strength of each and every beverage you make with this machine. Top off your coffee with the hottest steamed milk available in a super-automatic brewing system. World class milk foam will make any latte or cappuccino worthy of your favorite coffee shop! All in all, the ENA 9 is a perfect choice for anyone with big expectations and a small kitchen. Capable of fitting neatly under any cabinets, this model takes up a minimum of valuable counter space. Despite its diminutive size, the Jura ENA 9 Super Automatic packs a big punch. Providing a wide range of customizable brewing options, the ENA 9 can make any beverage to anyone’s tastes. Additionally, the all in one design means that you go from beans to beverage in mere moments. If you are looking for a model that is compact and capable, then this is the machine for you!